Do you think that Snapdragon 801-based flagship device you’re eying is high-end? Well, what Qualcomm has in store for early 2015 may make you want to wait for the next generation of mobile chipsets. Today, Qualcomm announced the Snapdragon 810 and 808 processors. So what do these high-end, 64-bit SoCs bring to the table? Let’s take a look. You may recall that late last year, Qualcomm announced the 64-bit Snapdragon 410. This quad-core chip, which is set to appear in low-end to mid-range devices sometime this year, features four 64-bit ARM Cortex A53 cores mated to an Adreno 306 GPU. Then two months ago, Qualcomm announced the higher-end Snapdragon 4-core 610 and 8-core 615 SoCs, which mate the Cortex A53 to the Adreno 405 GPU. Now, Qualcomm rounded out its first generation of 64-bit SoCs by announcing the high-end Snapdragon 810 and 808 SoCs. Both the Snapdragon 810 and 808 run the 32/64-bit ARMv8A instruction set—just like what we saw previously on the Snapdragon 410, 610, and 615. The Snapdragon 810 features four ARM Cortex A57 CPU cores, along with four lower power A53 cores. The 808, on the other hand, features two high power A57 cores, along with four lower power A53 cores. Both devices are built using a 20 nm die process (compared to 28nm for the 410, 610, and 615), and they are configured using ARM’s big.LITTLE architecture. Interestingly, the Snapdragon 810 and 808 mark the first time that Qualcomm uses a reference ARM CPU design in a high-end Snapdragon part, rather than its own, proprietary microarchitecture, such as the Krait 400 in the Snapdragon 800. On the GPU side, the Snapdragon 810 is set to use the Adreno 430, which promises to be 30% faster for games than the Adreno 420 that will be seen in flagship devices running the Snapdragon 805 later this year. It will also be more versatile, as it doubles the 420’s GPGPU compute performance. Furthermore, this increase in performance is accomplished while decreasing power consumption by 20%. The Snapdragon 808 features the Adreno 418, which is 20% faster than the current generation Adreno 330 that is seen in today’s Snapdragon 800 and 801 SoCs. 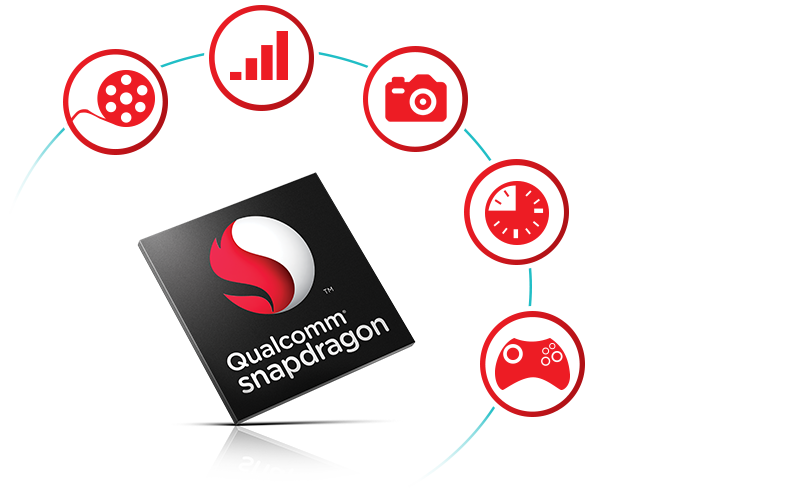 The Snapdragon 810 will be the first Qualcomm device to feature an LPDDR4 memory interface. The 808, on the other hand, will feature an LPDDR3 memory interface just like the rest of Qualcomm’s first generation 64-bit lineup. Because of the different memory architecture, it’s highly likely that the two chips won’t be pin-compatible. Thus, it’s also reasonable to assume that the 810 isn’t simply a higher binned 808 with all four A57 cores enabled. Regarding connectivity, both devices will support Category 6 LTE Advanced with 3×20 MHz carrier aggregation, enabling speeds of up to 300 Mbps. And in terms of image processing, the 810 will feature dual 14-bit ISPs (image signal processors) that enable support for up to 55MP image sensors. The 808 will feature dual 12-bit ISPs, though no information is given on maximum supported camera capabilities. While it’s no secret that this year’s Snapdragon 801 doesn’t bring much to the table in comparison to last year’s Snapdragon 800, the Snapdragon 810 and 808 are legitimately interesting chips. They also serve as the company’s first high-end 64-bit parts. It’ll also be interesting to see if later generations go back to a proprietary microarchitecture, or if they stay on ARM reference designs. What are your thoughts on the Snapdragon 810 and 808? Are you going to wait so to be able to get one of these chips in your next smartphone or tablet? Let us know your thoughts in the comments below.